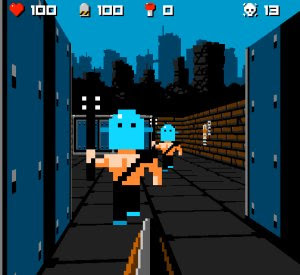 8bit killer is a first person shooter styled to resemble an 8bit NES game in look and feel. AD 2488. A long war has put human race on the edge of self-extinction. Four years ago, a space creature known as Master Brain arrived with the promise of a new dawn. Now, a huge army launched an attack to the few cities that are still on, following the plan of the creature. A small group of soldiers have formed an alliance to defend those cities and kill the master brain. This games tells the story of their final mission.